Dentons has been providing local information and business listings since 1967. Below is a list of useful contact details for a range of services in Bath, BANES and the surrounding area. This includes information on council services, education, transport, health, recycling, emergency services, things to do in Bath and a student guide. Bath & North East Somerset Council provides a range of services for the residents of Bath and the surrounding area including education and social care. Bath and the surrounding areas have the most stunning scenery, making its register offices in the area the ideal location to host a marriage or civil partnership. Hospitals in Bath receive great reviews with one of Bath’s NHS hospitals, the Royal United Hospital, highly regarded scoring 3.5 out of 5 in ratings. For an alternative hospital experience, CircleBath would be a great choice with this hospital being praised for its clinical excellence and five-star hospitality. There are a fantastic range of NHS services available to residents of Bath and the surrounding areas. Whatever the problem, be it a broken tooth or a broken leg, specialists are on hand. The Children and Young People’s Specialist Service comprises the Children’s Social Work services (including child protection; disabled children and children in need; children and young people in care; fostering and adoption) and leads on safeguarding children’s issues for the Council. The Bath and North East Somerset council has a number of teams and specialists in place, to support adults and the elderly through any difficulties they have. The popularity of sending a letter may be decreasing but in and around Bath, there are many post offices to buy a stamp, send a letter, purchase a rod fishing license or exchange money for a trip abroad. Bath is a city famed for sport. Team Bath’s success and the facilities at the University of Bath have put the City on the map. Such facilities are open to the public so if you fancy a workout, pop over to the University of Bath or any of the other great sports centres around the city. Bath Spa railway station and the city’s bus station are well staffed with helpful, friendly personnel who are more than happy to provide all the information and assistance you require for an enjoyable and safe trip. The bus station is a short distance from the railway station making it very easy for residents and visitors to travel in and around the city. The city of Bath provides good housing and support services for the homeless. Below are two locations where shelter is available for homeless people. The Chamber represents the interests of the Bath business community by engaging in vital debates about both current issues and future developments in the City. Our Bath dentons directory (47th edition) is currently delivered to over 69,000 business and residential addresses in and around the Bath area. The Bath distribution area includes the localities of Bathford, Combe Down, Lansdown, Peasedown St. John, Swainswick, Twerton and Weston. For more information on our directories, please click here. The city of Bath, situated in the south west of England and the beautiful countryside which surrounds it, has been described as one of England’s most beautiful places to visit. 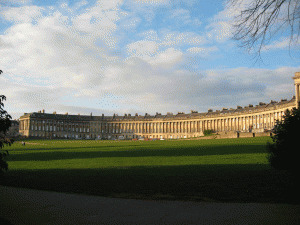 With its hot springs, Roman Baths, splendid abbey and Georgian stone crescents, Bath has continued to attract visitors for centuries. Set in rolling Somerset countryside just over 100 miles west of London, Bath is a fabulous and unforgettable place to visit and it is twinned with the towns of Aix-en-Provence in France, Alkmaar in The Netherlands, Braunschweig in Germany and Kaposvàr in Hungary.The city has a variety of theatres, museums and other cultural and sporting venues, which have helped to make it a major centre for tourism, with over 1 million staying visitors and 3.8 million day visitors to the city each year. The city has two universities and several schools and colleges. There is a large service sector, a growing information and communication technology industry and strong creative industries which provide employment for the population of Bath and the surrounding area. Bath (Aquae Sulis) was part of Roman England (Britannia Province) and its river, the Avon, was originally integrated into the Roman system of border defence. The baths were constructed as part of the first temple, which was dedicated to Sulis, the local goddess whom the Romans identified as Minerva. From 411AD, which marked the end of the Roman rule, until the 9th century, the site was abandoned. Bath was a centre for the wool industry in the Middle Ages. From 1147, it also served as a hospital centre for those suffering from rheumatism. Bath was also known for its religious importance and served as the Episcopal Seat between 1091 and 1206. 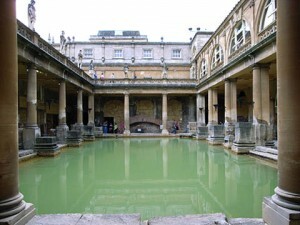 In the 18th century, under the reign of George III, the forgotten baths were rediscovered. During the same century, the city experienced major architectural and planning developments. Today, Bath remains a centre that is known for its hot springs.